JALANDHAR, Punjab (December 29, 2014)—Union home minister Rajnath Singh’s terming of the November 1984 violence against Sikhs as “genocide” has given fresh ammunition to Sikh groups trying to internationalize the issue. Instantly taking a cue from his statement, US-based rights group Sikhs For Justice (SFJ) has said that it will use this “admission” by the Indian home minister for getting a resolution moved in the 70th UN General Assembly Session to declare 1984 anti-Sikh violence as genocide. While starting the disbursement of enhanced compensation to the victim families of the 1984 massacre in Delhi on December 26, Rajnath had called the violence “genocide.” It is for the first time that the Indian government, and that too at the level of home minister, has used the term genocide for the massacre in the last 30 years. 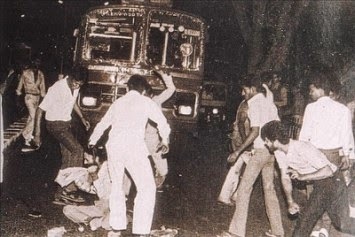 Earlier political and official machinery had always referred to the violence as “riots” even as some Sikh groups and activists had been referring to these as massacre or genocide. The home minister had also said that justice was yet to be delivered to the victims. SFJ said that it would lobby with the member countries that have signed the UN Convention on Genocide to move the resolution. “Now that the Indian home minister has labeled the violence as genocide, it has become much easier for us to push the issue further. His statement has opened new doors for us,” said SFJ legal adviser Gurpatwant Singh Pannun. “SFJ will approach Israel, Armenia, Bosnia and Rwanda, which have been victims of genocide for moving a resolution in the United Nations during the 2015 General Assembly Session to recognize the 1984 Sikh genocide,” he added. According to Article 1 of the UN Convention on Genocide, member countries have confirmed that “genocide” is a crime under international law, which they undertake to prevent and punish. “Starting with Ron Prosor, permanent representative of Israel to the United Nations, we will approach representatives of other nations that have witnessed genocide seeking their support in moving the 1984 Sikh genocide resolution in the General Assembly,” said Pannun.